The AdWords Ad Rank Formula: How Does It Determine Ad Position? How Does AdWords Ad Rank Determine Ad Position? Paid search advertising in Google AdWords is an auction-based system, and advertisers place bids for how much they’re willing to pay for a click to their website from a search result page. Google then uses an auction system to rank ads on its search result page. 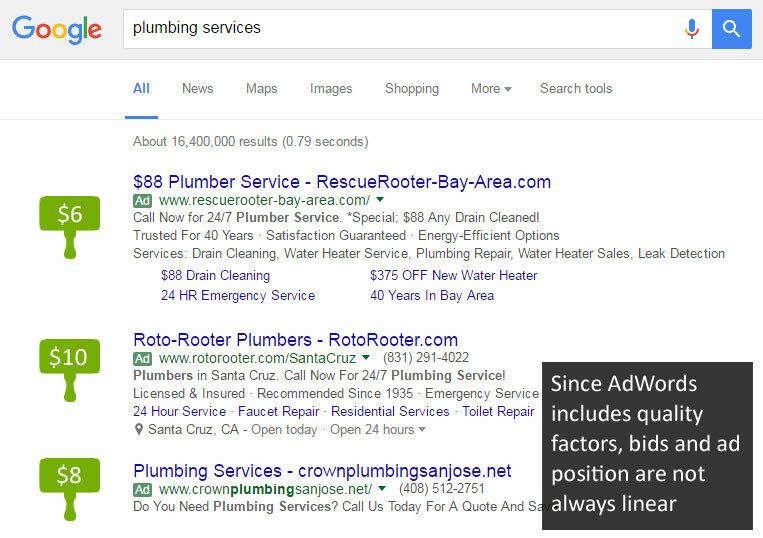 Google places an emphasis on promoting quality ads for their users. To do this, Ad Rank incorporates factors about quality, in addition to bid amount, that help to determine ad position on a search result page. It’s important to note that AdWords is not a simple auction. If AdWords were a simple auction, the highest bidder would always occupy the top advertising spot, the second highest bidder would occupy the second position, and so on. However, that’s not always the case. In a simple auction, let’s assume the advertiser in position one is willing to pay $10 for a click; the advertiser in position two will pay $8; and the advertiser in position three will pay $6. In an AdWords auction, because Ad Rank incorporates quality-based factors, the ads might be ordered differently, in a non-linear order. For instance, the advertiser in position one might be willing to pay $6 a click; the advertiser in position two might be willing to pay $10; and the advertiser in position three might be willing to pay $8. Now let’s analyze the factors of Ad Rank to see why the ads would end up in this order. Max bid is the maximum amount an advertiser is willing to pay for a click for a given keyword. Quality score is an automated 1 to 10 score that Google assigns to the experience a user will have with an ad and a landing page for a given keyword. There are a variety of things that impact quality score, including ad relevance, landing page experience, and expected click through rate. Check out this article for more information on quality score. Ad format is the additional format features, such as ad extensions, which make an impact on click through rate. Note: Google does not publish the formula for Ad Rank, but we can make some assumptions to get a pretty good idea of how it works. In our example, advertiser one has the lowest bid at $6, but their quality score and ad format are both excellent, so they get a 10 for each of these. Their final ad rank score is 9.6. Advertiser two has a higher bid at $10, but their quality score is low, at a 3. Since they’ve added lots of relevant ad extensions, they get a 10 for their ad format. Their final ad rank score is 7.2. Advertiser three has a medium bid at $8, and a decent quality score at 5. However, they don’t have many relevant ad extensions, so they get a 2 for that. Their final ad rank score is 6.2. This example helps illustrate why quality of your ads and the ad format of your ads play an important role in determining ad position. When looking to increase your ad position, first consider how your quality score and ad extensions are contributing to your positioning, and then look to changing your max bid. This approach will help to minimize costs while you move toward achieving your goals.